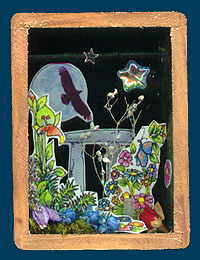 This is a pocket shrine, created for a shrine exchange hosted by Patty in the UK, September 2000. This box represents the Otherworld, the fantasy land of the faeries. In legends, it’s a world similar to ours but also different. The black sky represents the darkness people travel through, to reach this land. The flowers (painted, and dried, natural flowers) are part of the dazzling beauty of this Otherworld. The dangling opalescent star is what gives the shrine movement and life. The small bit of quartz crystal in each box represents magick in everyday life, and the very real foundation of the Otherworld. I started with small wooden boxes, purchased at the local fabric store, JoAnn Fabrics. They’re each about four inches tall and have a removable lid with a star cut in it. I stained the outside of each box to a light oak color, and added color stains using a stencil that I cut in a five-pointed star shape. The inside of the lid is painted with gold. Inside the box, I used a moss green shade of Lumiere paint. The back of the box is lined with black plush velvet, which I glued to and wrapped around a cardboard base, before gluing it in place with Aleene’s Tacky Glue. Then I drilled holes in the sides of the box, inserted part of a bamboo skewer (from barbecue supplies) and painted it matte black, so it’s sort of like a rod in a closet. Next, I drew a dolmen, and painted it with watercolor. Both this and the moon/bird images were scanned a printed on shiny photographic paper, which I trimmed neatly before gluing the images in place on the velvet. The flowers and elements of the Greenworld were drawn with a zero point Rapidograph, and painted with Dr. Ph. Martin’s concentrated watercolors. These were scanned and printed on a heavy matte paper. These pieces (two per shrine) were glued, diorama-style, using tabs I left on the sides of the art, when I trimmed it. Next, I trimmed and glued bits of moss and dried natural flowers in the shrines. I used Aleene’s Tacky Glue for this. Then, I added one small quartz crystal in each shrine, slightly hidden in the greenery. Finally, I suspended an opalescent star bead from the “closet rod” in the box, using black thread. I glued one opalescent glitter star to the “closet rod”, and one directly to the black velvet background. The outside of the box was highlighted with gold, and varished using a glossy polyurethane finish. Each of the four shrines sent to this exchange contained a small plastic bag. In it, there was a quartz stone with a hole in it, strung on a purple satin ribbon. In faerie lore, if you look through a stone with a hole in it, you may be able to view the faerie world. I made a total of eleven of these shrines. Four went to the exchange, three are kept in our family, three were sent to “four creative somethings*” subscribers who requested them. The remaining one was sold to a collector at Artfest 2001. *”Four creative somethings” was a four-part subscription to small pieces of art, sent at random to people who signed up. That art subscription is no longer available.